Check out what we did in 2018 and this years schedule will be posted here September 2019…. 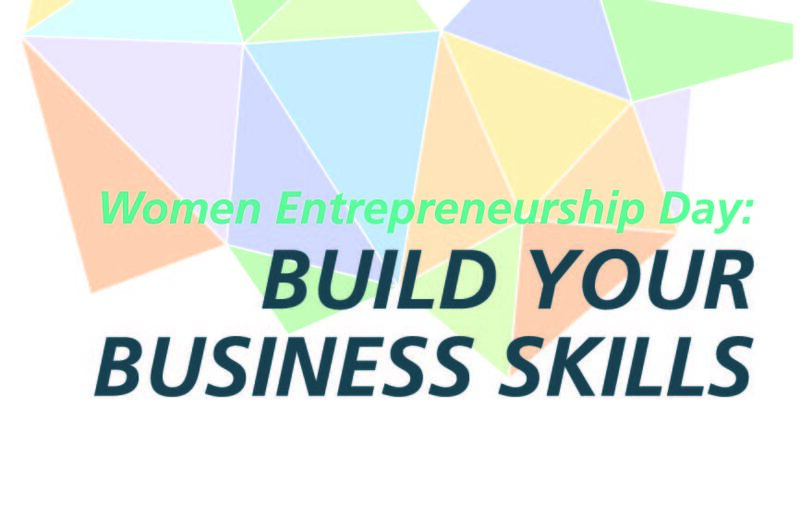 startGBC, in partnership with Dell, presents to you Women Entrepreneurship Day: Build Your Business Skills. Join us as we celebrate women who are defining the world of entrepreneurship, one business decision at a time. startGBC is dedicated to helping enthuse more women to consider entrepreneurship and to continuing the growth of women entrepreneurs in Canada. With female entrepreneurship on the rise, nurturing entrepreneurial growth in women is an investment worth making. startGBC would like to thank our sponsor, Dell, for supporting women entrepreneurs at George Brown College and throughout the nation. Dell is committed to accelerating the increasingly powerful role that women play in driving global economic growth. Through the Dell Women’s Entrepreneur Network, Dell connects female entrepreneurs across the globe with networks, sources of capital, knowledge and technology, giving them the power to do more. We are excited to announce that Dell has generously donated the new Rose Gold XPS 13 Notebook to be won by one lucky female attendee! The XPS 13 Notebook is the world’s smallest 3-inch laptop with captivating Dell Cinema and next-gen InfinityEdge, valued at $1500! To enter to win, you must attend the event for more instructions. 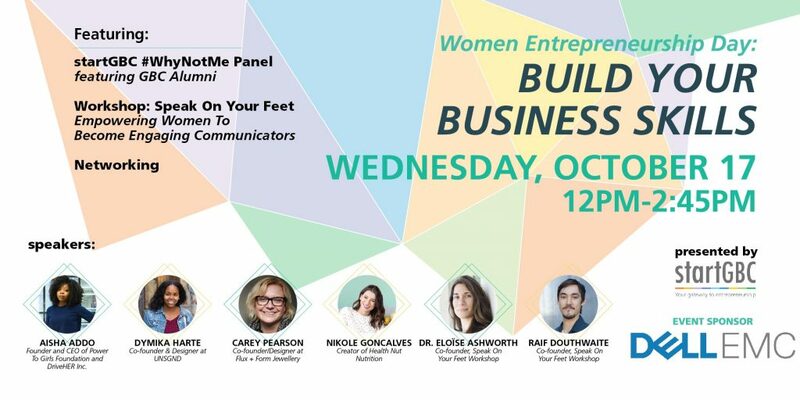 Join us as we speak with four amazing women who all had the same goal of building a profitable business and being their own boss. We sit down with four George Brown College Alumni as they share their mistakes, struggles, and achievements throughout their entrepreneurial journeys. 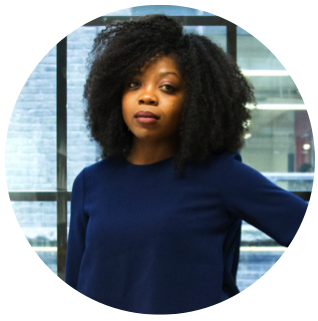 Aisha Addo, Founder and CEO of Power To Girls Foundation and DriveHER Inc.
Aisha Addo is the founder of Power To Girls Foundation, a non-profit organization that offers young girls mentors and role models. 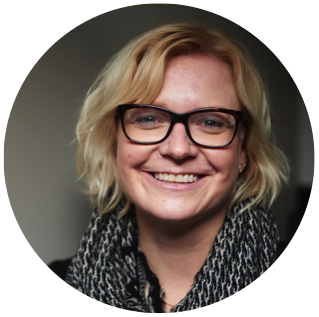 As a facilitator and director of Power To Girls, she uses her personal experiences and knowledge to create safe and engaging spaces for the girls she works with. She is a recipient of the Young Black and Gifted Award for Community Service and was also named a Black Diversity Group Role Model and One of 100 Black Women to Watch in Canada and among the 150 Black Women making history in Toronto. DriveHER, the ride-sharing service for women by women, is her latest initiative and has officially launched in Toronto last week! Aisha is GBC Alumni, completing an Advanced Diploma in Business Administration Accounting. Carey Pearson is the co-founder of Flux + Form Jewellery. As a previously accomplished sales executive in the television media industry, she always felt something was missing. That is when she tried her hand at the creativity of crafting jewellery. The passion she felt when designing or producing a new piece was all consuming. While it started out as a part time hobby, the desire finally took over. One day, while on maternity leave, she took the plunge and enrolled in the Jewellery Methods Program at George Brown College. On her very first day at school, Carey knew this was exactly where she belonged. And she has never looked back, since. Through her career as a jeweller, Carey continues to thrive in the stories of her clients and is energized by playing a role in their lives through her creations. 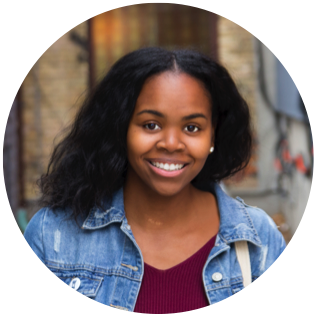 Dymika Harte is a George Brown College Graphic Design graduate and founder of UNSGND, an all-female creative agency. Finding her start in high school, competing in design and photography competitions and eventually landing her first design contract with the City of Toronto, Dymika quickly turned her passion into a business. UNSGND is one stop branding, design and print hub for small businesses and recording artists driven by young female creatives. Nikole Goncalves is the creator of the popular YouTube channel, Health Nut Nutrition, where she shares healthy, but tasty food recipes that are “guaranteed to make your taste buds dance.” Her idea for Health Nut Nutrition blossomed when she realized she was still able to make healthy food recipes while backpacking through Australia with her partner. That experience inspired Nikole to show others how healthy living is easy, no matter where you are. 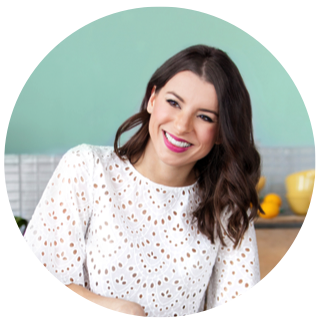 Her YouTube channel has over 400,000 subscribers and has reached a total of 26,000,000+ views. Nikole completed an advanced diploma in Business Marketing at George Brown College. Speak On Your Feet is a powerful workshop that provides personalized coaching to learn effective communication through enjoyable and inclusive medium of applied improvisation. This workshop will empower you to become more creative, communicate your ideas with confidence and be able to keep the conversation flowing on the stage of life. Have fun and develop skills that will come in handy for your professional presentations, job interviews, collaborations and social networking. 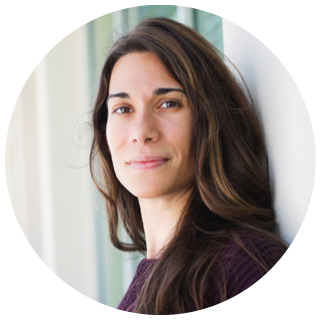 Eloise Ashworth is the co-founder of Speak On Your Feet, a powerful workshop that provides personalized coaching to build effective communication skills. She has a PhD in Marine Science and is also a Master Scuba Diver. After conquering her own fear of public speaking, she now helps professionals become engaging public speakers through the medium of applied improvisation. Raif is also the co-founder of Speak On Your Feet. 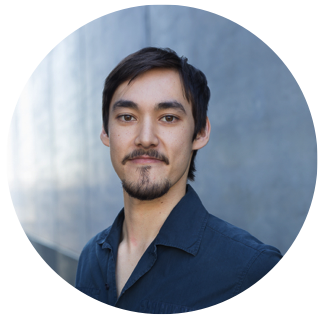 He works with individuals, small companies and Fortune 500 companies to improve communication, teamwork, networking skills through the holistic approach of applied improvisation by finding overlooked opportunities, and customizing work and life culture to be more effective, while increasing enjoyment. Pamela is a Sales Director with Dell EMC and a part of the Senior Leadership team. She leads several groups aimed at women in IT reaching their full potential. She also coaches and mentors colleagues at Dell EMC and in the IT industry. 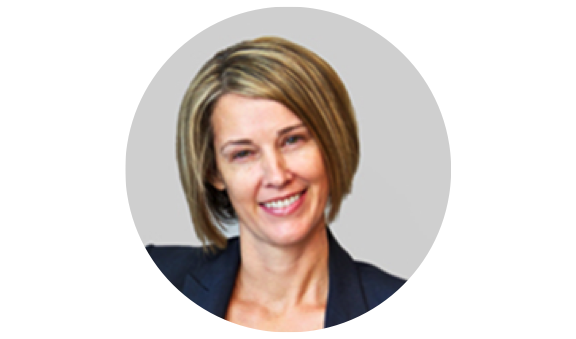 Pamela has a proven leadership track record and over 15 years of experience driving sales growth in the technology industry. Her greatest strengths are her drive, and leadership. She thrives on challenges, particularly those that expand the company’s reach. Pamela holds a bachelor’s degree from Trent University. We will be providing refreshments and snacks.